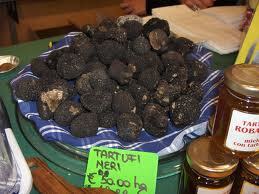 This is the time of the year to discover the wonderful and expensive world of truffles!!! White or black, this gourmet addition to your meals is luxurious: thousands of pounds to spend on it beacuse it grow only in the wild, while only expert foragers and highly trained dogs can find it! So you can understand why it is called oro bianco and oro nero, meaning white and black gold. In the Langhe area, there is the truffle’s hearts, exactly in the hills of the Monferrato region. A “trifulau” is the one you are looking for: he/she can guide you in exploring the traditions related to the local truffle varieties. October is “the” month for Italian food festivals, not only truffle but also mushrooms, chestnuts, chocolate. On Fall Italy is ripe of food festivals and wine harvest celebrations! Not to miss is the Slow Food’s big International Food Event in October! Asti is waiting for you too. Its beautiful Gothic cathedral is the heart of a lively medieval city, and of the most famous Barbera producer. A taste of heaven along with Barolo and Barbaresco wine you can find in Piemonte region. Alba White Truffle Festival is in October in the Piedmont town of Alba and it is one of the biggest truffle festivals in Italy, peculiar also for its donkey race. Instead if you lok for an historical walk, check the Maschera di Ferro, a festival and a historic reenactment of the Man in the Iron mask which takes place in the Piedmont region the first weekend of October exactly in Pinerolo. According to the legend, the man in the iron mask was held in captivity for 11 years in the French fortress of “Pignerol” (ancient word for “Pinerolo”), in Piedmont. Each year Sunday afternoon after the performance, the mask is finally removed and the face of the man wearing it revealed. This entry was posted on Thursday, September 6th, 2012 at 7:47 pm	and is filed under Events in Italy, Italian Recipes and Food. You can follow any responses to this entry through the RSS 2.0 feed. You can leave a response, or trackback from your own site.